INDIANAPOLIS – With college costs rising and students’ debt load mounting, there’s a growing national debate over how to make higher education affordable. What’s missing from the conversation is a clear and common understanding of what “affordable” means to students and families. 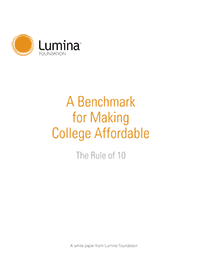 To address that gap and reset the conversation around college affordability, Lumina Foundation today released the Affordability Benchmark for Higher Education—a framework that clearly defines college affordability in terms of what families and students can and should pay. By establishing a shared definition of affordability, the benchmark sets the stage for policymakers and higher education institutions to work together to build a system that’s affordable for every student. It also enables students and their families to better understand –and plan for –the financial realities of college. The Affordability Benchmark for Higher Education helps to define a clear and common understanding of what “affordable” means to students and families. Students work 10 hours per week while attending college. Under this “Rule of 10” benchmark, the amount defined as affordable would be based on their particular circumstances. For example, families living below 200 percent of the poverty level should not be expected to contribute savings or take on debt, according to the benchmark, but the 10 hour a week contribution from students’ work, which amounts to about $3,625 per year, would be feasible. A family making an average of $100,000 might be able to contribute $51,500 based on saving 10 percent of income over 10 years. The benchmark comes at a critically important time. College prices have ballooned by an average of 45 percent in real dollars over the last decade, even as household income has declined by 7 percent. The burden of paying for college can deter students from enrolling and earning their degrees, and that’s particularly true for low-income students. Only 9 percent of students from the lowest income quartile have bachelor’s degrees, compared with 54 percent from the highest quartile. That’s especially troubling given that labor economists project 65 percent of all jobs will require postsecondary education by 2020. In coming weeks, Lumina will work with a number of stakeholder organizations to determine ways policymakers and higher education leaders can apply the Affordability Benchmark to rethink how students pay for college. Additional issues that will need to be considered include examining appropriate levels of state support to make the benchmark realistic for public colleges; how best to ensure quality in the context of affordability; and ways to improve need-based aid to meet the benchmark.